During World War 2 the U.S. Army had two very well known airborne divisions, the 101st and 82nd. A new figure from Corsar Rex provides a paratrooper from the 82nd Division. The figure comes in three main parts, the body with head, two arms, plus separate helmet, holster, canteen, and grenades. 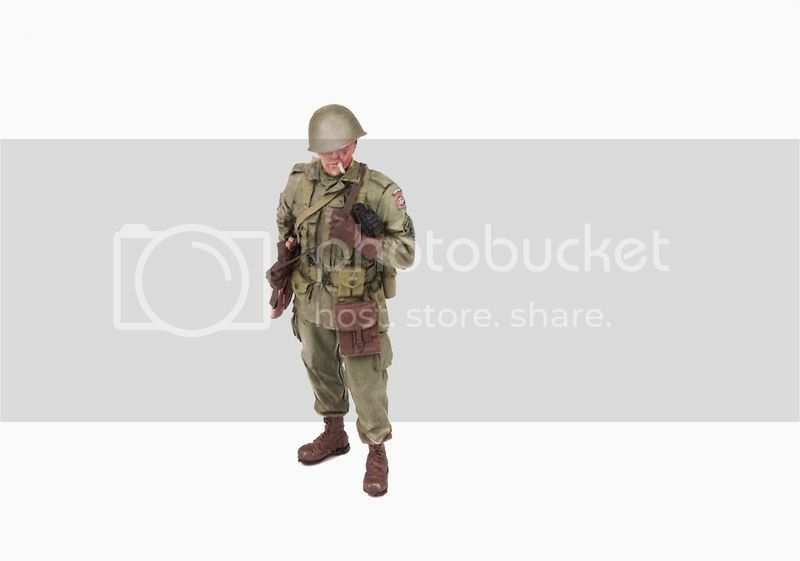 One of the latest figures from Corsar Rex is a figure representing an NCO of the 82nd Paratrooper Division of the U.S. Army. The figure is cast in a light grey resin, and is very well cast with minimal flash. The cast detail is very well done, with realistic creases and other uniform detail. On the sleeves the division badge and rank are raised, but will require careful painting to represent. The paratrooper is in a standing position with his Thompson machine gun slung over his shoulder. His right arm is positioned to be holding the weapon sling, but that is not included in the casting. His left arm is being held against his chest. The pose does look natural and is very well done. It should be noted on this figure the head is cast onto the body, which may cause a little issue with painting the face, as some like to paint the heads separate from the body. The facial detail and expression are very well done. It is a full head with a bald top with the helmet separate, a quick test fit show what looks to be good fit. The rest of the accessories are separate as well, including a holster, canteen, and grenades. I did assemble most of the figure, and the fit of the arms is very good, with indentations in the casting making the addition of the holster and canteen look real. The Thompson machine gun is cast into the right arm, and as mentioned there is no cast sling to match the slung weapon. This was easily remedied with a couple small pieces of masking tape and CA glue. Also, it is easier to mount the holster prior to mounting the right arm. I also left the helmet off for ease of painting. This new figure from Corsar Rex is very well done, and looks great assembled, and it will definitely look better painted. The case detail is well done, including the face and accessories. The figure does lack the sling for the weapon to match the pose, but this is an easy fix. I highly recommend this figure for a diorama or vignette. Highs: Great casting, great details. Lows: No sling provided for pose. Verdict: Great figure for a diorama or vignette, highly recommended. Just an FYI, if you look carefully at the boxart you can see the sling is really supposed to go from his right hand to his left hand and up over the left shoulder.